RIGOL Announces New RSA5000 Real-Time Spectrum Analyzer. 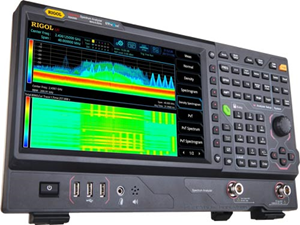 Beaverton, OR - January 18, 2018 - RIGOL Technologies announces a significant addition to its portfolio of RF Test Instrumentation with the introduction of the New RSA5000 Real-Time Spectrum Analyzer. The RSA5000 combines the power of a high performance swept spectrum analyzer with superior Real-time performance unmatched in this product category. Available in 3.2GHz and 6.5GHz models all RSA5000 Series Analyzers provide Resolution Bandwidth (RBW) down to 1Hz, a noise floor as low as -165dBm, and provide a full span sweep as fast as 1ms. In addition, the analyzer features up to 40MHz of Real-time bandwidth, a minimum probability of intercept (POI) of 7.45 µs, 7 rich visualization modes and powerful triggering capability, providing a complete analysis package for engineers developing and integrating today's wireless technologies. Unlike most analyzers in this class RIGOL proudly specifies its Probability of Intercept performance. The RIGOL RSA5000 takes 146,484 FFTs per second providing a minimum 100% POI of 7.45 µs. This class leading performance allows users to confidently capture pulsing, hopping and fast transient signals as short as 7.45 µs and display accurate power 100% of the time. The RSA5000 provides 7 rich data views to allow engineers to visualize the most complex RF environments. Density Displays help to see time varying signals and resolve hidden and superimposed signals in the same frequency band. Spectogram Displays allow users to evaluate changes in signal behavior over time, especially useful in identifying hopping patterns and characterizing PLLs. Power versus Time Displays show the RF Power for the real time span over a user defined time span helping measure the duration and timing of pulsing signals and characterizing signals with amplitude modulation like ASK. The RIGOL RSA5000 utilizes a QuadCore processor and is built on a Linux operating system. Its flexible user interface allows customers a choice in how they interact with their instrument. It has a 10.1" Capacitive Touch Display, supports a keyboard and mouse, or you can utilize traditional softkey and knob control. HDMI out allows use of a large external display and USB/LAN support allow easy networking, programming, remote control and data sharing. "The RSA5000 is really a transformational product. We are delivering a high performance swept spectrum analyzer with category leading Real-time capabilities starting at just $7,999," continues Mike Rizzo. "We are delivering significantly greater value to customers striving to integrate RF Technology into their IoT designs." The RSA5000 is available and shipping now. Please contact RIGOL or any authorized partner for information.